Dr. Tyrone A. Holmes is an author, speaker and coach. He is certified as a personal trainer through the American Council on Exercise, as a Level 1 (Elite) cycling coach through USA Cycling and as a TrainingPeaks Level 2 Certified Coach. Dr. Holmes provides Cycle-Max Coaching for cyclists and multisport athletes who want to improve their performance on the bike. He has published three books: Training and Coaching the Competitive Cyclist (2010), Developing Training Plans for Cyclists and Triathletes (2011) and The Business of Training and Coaching (2014). 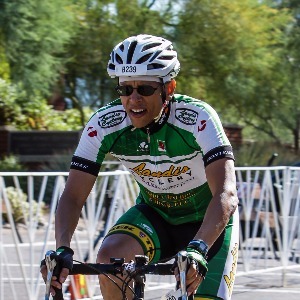 Dr. Holmes is also the Club Coach for the White Mountain Road Club in Tempe, Arizona. Success. Coach Tyrone Holmes has been notified of your message. To hire Tyrone Holmes as your coach, select the coaching service that is right for you.